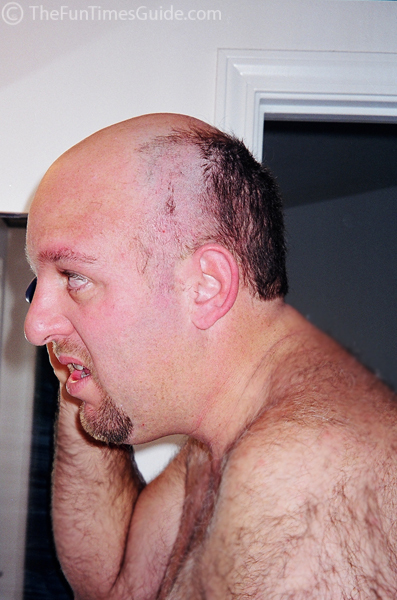 Men… Are you (or someone you know) dealing with thinning hair? Bald spots? 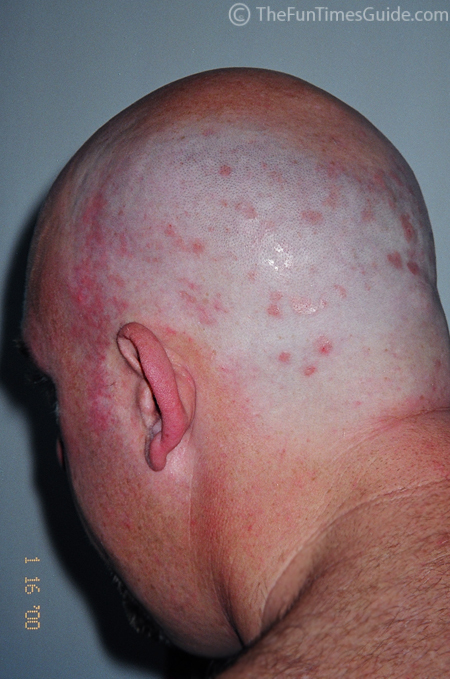 Excessive hair loss? Male patterned baldness? At least that’s the way Jim felt when he started losing his hair several years ago. Following is a step-by-step photo collage of the process Jim went through the day he decided to shave his head and start living life as a bald man… by choice. 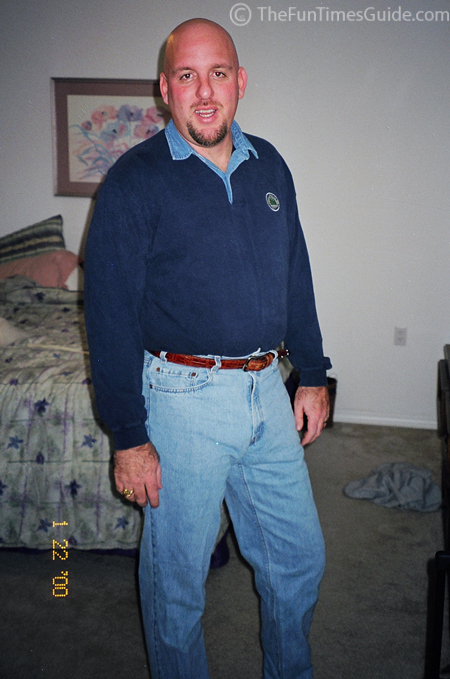 Days after our wedding in 1999, Jim took on a whole new look. It all started with “a bad haircut”. His haircut was pretty bad… and I didn’t see that we had much to lose, so I encouraged him to go for it. I think he was afraid he’d change his mind if he’d slept on it a night or two. I’ve never seen so much determination in this man as the day he committed to shaving his head bald! The hair on his pecs can speak volumes about his psyche. Specifically, one study showed a connection between excessive body hair and extra intelligence… among other things. Jim started by using his trusty ‘ol beard trimmer first, to get the bulk of what hair remained on his head. This was the part that felt the best. And looked the best when it was all said & done. Then, the red spots became really obvious… even from a distance! OMG, What Have We Done?! Jim got so nervous, he started pacing. He was second-guessing whether he had done the right thing by shaving his head. Luckily, our dog Jersey was there to console him. Ready To Be Seen In Public? Luckily, Jim had a couple of days to try & get the red dots to go away before he had to go back to work. So the next course of action was to put on a hat and head to the nearest pharmacy to see what they could prescribe for all the red spots. Luckily, the Cortisone Cream worked… kind of. When he returned to work 3 days later, the red dots were still visible. But they weren’t nearly as bad as before. 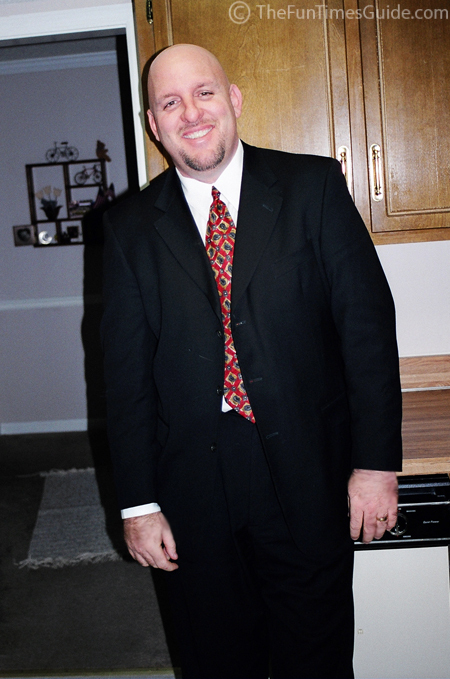 I give Jim props for the bravery to not only go to work in a “professional” office with a head full of spots… but also for his fearless attitude showing up in a suit and tie with a bald head for the very first time. Luckily, he really did look good bald. And, spots or no spots, it was a change for the better. Everyone seemed to agree. To this day, I find it hard to imagine Jim anything other than bald. It’s a look that suits him so perfectly! I guess some guys have the skull for it, and some don’t. Fortunately, Jim has it. He also began to gain notoriety in town as a celebrity of sorts. Yep, he practically became famous overnight! Little kids (and even many adults) would stop and stare at Jim in restaurants… grocery stores… anytime he was in public. Why? Because they thought he was either Stone Cold Steve Austin (the wrestler). Or, Minnesota Governor (and former pro-wrestler), Jesse Ventura. Or even Jerry Springer’s on-air bouncer, Steve Wilkos! Often, after Jim would explain that he wasn’t who they thought he was, they still wouldn’t believe him. They thought he just didn’t want to be seen in public or something. The only thing Jim said he would do differently is to use this headblade razor for bald guys. Here’s how to find the best fogless shower mirror for shaving your head in the shower. Here are some simple ways to extend the life of your razors. Must Read: The Zen Of Shaving: How A Double-Edge Razor Can Change Your Life.